Leucadia National Corporation/CAR/SABLC: Leucadia National Corporation is the parent company of Community Airport Redevelopment, which was changed to the St. Andrew Bay Land Company. Leucadia has home offices in Salt Lake City, UT and New York City. Labeled as a “mini Berkshire Hathaway” as noted in their Wiki page, Leudadia was a $6.6 billion company in 2006 generating revenue in a variety of ways including mining & drilling services, telecommunications, health-care services, manufacturing, banking and lending, real estate, and winery businesses. Other notable developments by Leucadia include Rosemary Beach and Draper Lake. 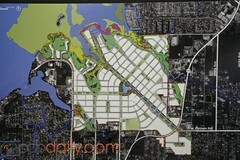 The community will be walkable: With 703 acres, the property consists of a little more than a square mile. From the center, it would take approximately 10 minutes to walk to the edge of the property, and from one end to another a walk would take around 10 minutes; unless you’re a speed walker, in which it would take about 8.3 minutes. Although little design conceptuals have been made, it is anticipated that it will be an open community that is very ped-friendly. 3,200 total residential units: The development has the capacity to hold 3,200 residential units with an expected spread of approximately 60% single family and 40% multi-family (including condos and townhomes). Development time-tables will be completely subject to market demand and the expected build-out time is in upwards of 15 years. Wide open community areas: Some of the discussions the other day included creating an area that Panama City could collect for events and holidays and enjoy company and the water. 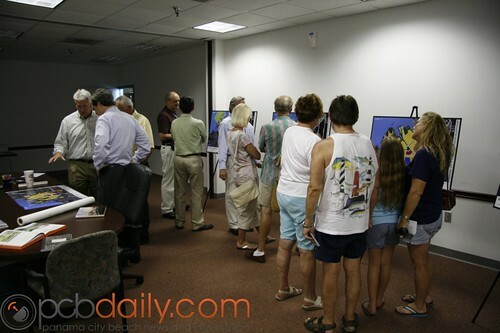 Right now, Panama City has no area like Pier Park to hold these community events. I believe Panama City could greatly benefit from this. If they were to bring in the right marketing team and layout the initial public development right, they could create a community before there’s actually a community there. Talk about buzz. Multiple points of access: Feeding into the community are 8 points of access varying the ways with which to handle the out-flow and in-flow of the increased traffic. Access roads include Frankford, Airport Road, Lisenby, Airport Circle, Baldwin, W 39th Street, and Jackson Way. 700,000 square foot of commercial/retail: Some mixed among the residential, others in concentrated areas, there will be approximately 700,000 square feet of commercial and retail area. Right now, there are plans to have a “Town Center” in the middle of the community that will house the tallest of the structures, in addition to a higher concentration of retail. There will be a small lake with a boardwalk around it and the buildings will have retail on the first floors, office space on the second floors with residential above that. Height limitations set at 120 feet: I was told that even though maximum height is set for 120 feet as defined by the zoning (light industrial), the maximum planned height at this time is 80 feet. In addition, the maximum height buildings will be in the center of the development, reserving the water-frontage for 2 and 3 stories. Nothing available to purchase until 2012: The St. Andrew Bay Land Company will take possession of the land the day after the airport operations are moved to the new airport site. Upon possession, it is estimated that infrastructure installation will take approximately 1 year with real estate product available to purchase last 2011 or early 2012. The SABLC may build some, but it is expected that they will sell plats to developers to handle build out once infrastructure is in place. Tons of green space: All the green areas depicted in the images will be open park-like areas that may have open grassy areas, trees, nature trails and the like. 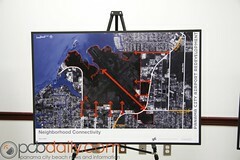 The idea, again, is to create a pedestrian-friendly community that encourages the natural beauty of the Bay County area. No water-front buildings: There will be plenty of water views to be had from residential units, but nothing will be right on the water, cutting off access from the general public. The design is intended to keep the pristine areas pristine, and enjoyable by everyone. There will be large open areas in between the buildings and the water. All open to the public: The whole community will be open to the public. Amenities such as shopping, dining and the marina will be open for everyone to enjoy and the community will not be gated. 150 boat marina: Quenching the thirst for much needed wet slip space, this new community will house a 150 slip marina capable of accommodating vessels up to 60 feet. The marina depth will be 6 feet. There is only one small spot on the whole plot of waterfrontage that will accept a marina without having a negative environmental impact; located at the top, close to where the runway terminates into the bay right now. Marina to be developed first: Right now, talks include developing the marina first, in addition to around 10 shops and restaurants with some residential above around the marina. The idea is to give something to the community that is usable right now (or in a couple years) until the demand for real estate product comes back. The conversations I had were very interesting in that for once, I was talking to a developer that wasn’t acting like a developer, but a rational, reasonable person. With my background in preconstruction sales and marketing I have quite a bit of experience working with developers and new developments, and it always seems like they are drinking their own cool-aid; not so with these guys. They were very much verbal about the current conditions of the market and were very open with the fact that at this time its hard to tell where the market will be in two years. This, by the way, is exactly opposite the outlook of most of the developers I’d worked with in the past. typically with a new development such as this, you’d expect to hear aggressive development time-lines. I was pleasantly surprised and very impressed with their level-headed outlook. The developmental options are plenty: They’ve kept the initial planned layout open so as to offer a wide variety of developmental options. With plats around 500 by 260 feet, it will be easy to determine where single family versus multi family will go in the future, based on market demand. The plats are large enough to accommodate an alley system, should they decide to go that route. Sasaki Associates brought in to help with initial planning: Sasaki and Associates are known for their master planning of the 2008 Beijing Olympics, Ruston Town Center in Virginia, The Woodlands in Houston TX, Charleston South Carolina Waterfront Park, and Harbor Town in Hilton Head, just to name a few. This really sounds pretty darned cool. As someone who lives just south of the old airport, I’ve been very keen to get news on what’s coming. Non-gated community? nice. Retail and commercial? Sounds great. Open areas? Awesome! And having a few new road connections up there sounds good, too. Grrreat for PC. 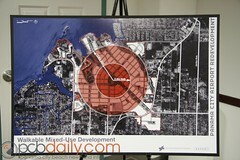 See what develops as a spin-off from the New Airport. All the Naysayers should take a closer look at what will happen in the next 10 yrs to the area and North of us because of the new airport. I look for a NASCAR Track coming as well as big ticket family orientated theme parks. It takes an infra-structure to support big ticket development and it is coming. The new PCB Parkway from S Walton to Hwy 79 will be a big plus also. I heard that a 55+Active Community was going to be developed where the old Airport property was. If this is true please let me know as I am very interested. I have searched every where for a Del Webb community in the Panhandle and they are non existent except for Jacksonville, I heard some other company was going to do something similar for reasonable costs.